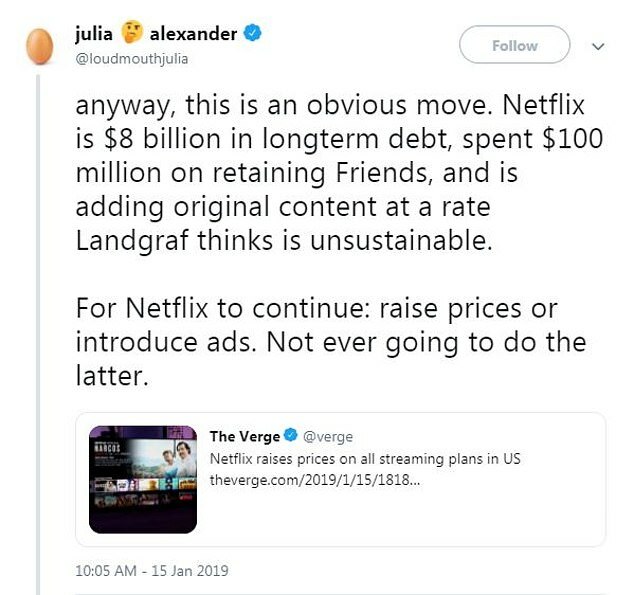 All those made-for-Netflix originals that are largely panned by critics and mostly ignored by subscribers have spurred the streaming platform into enacting an 18% price hike to pay for it all. According to the Seattle Times, Netflix will be hitting its 58 million U.S. subscriber base with the biggest price hike since the video streaming service launched 12 years ago. "Its most popular plan will see the largest hike, to $13 per month from $11," reports the outlet. "That option offers high-definition streaming on up to two different internet-connected devices simultaneously. 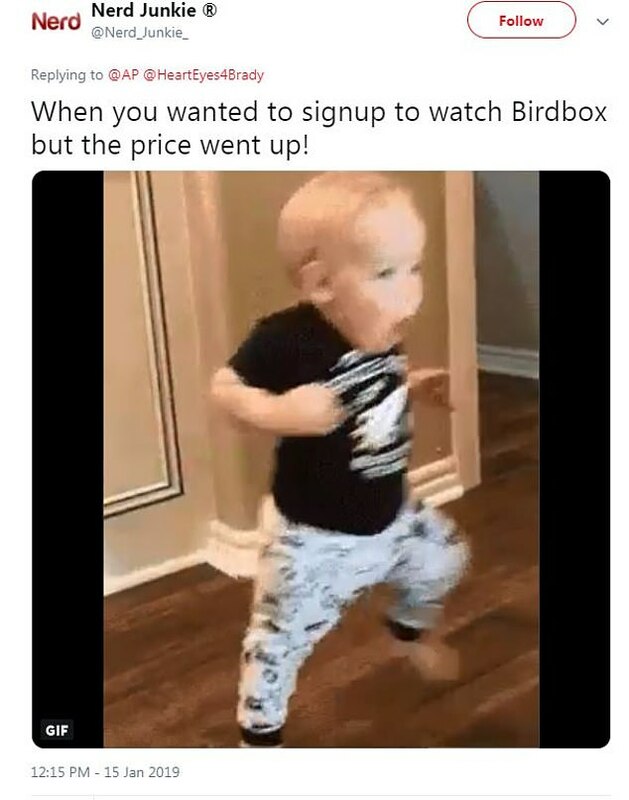 Even at the higher price, that plan is still a few dollars cheaper than HBO, whose streaming service charges $15 per month." Wall Street appears to have welcomed the price hike: Netflix shares shot up a full 6% in midday trading this week. Netflix is implementing the price hike to help pay for the vast amounts of debt it incurred in creating its original programming, which began with the now-canceled "House of Cards" starring Kevin Spacey. Other than the successful original film "Bird Box" (though the viewing numbers are debatable), the only other original hits Netflix has produced since the Spacey-led vehicle are "Stranger Things" and "The Crown," both of which will be entering their third seasons this summer. The urban-fantasy "Bright" starring Will Smith and Joel Edgerton was a critical bomb. Netflix has raised its subscription prices as many as four times; however, this marks the first price hike that will hit all 58 million U.S. subscribers at once. The lowest priced plan is bumping up a dollar to $9 per month, while the premium plan is rising $2 to $16 per month. 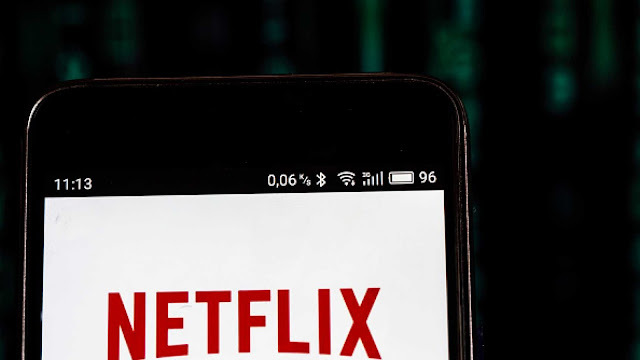 The Seattle Times notes that "[c]ustomers in about 40 Latin America countries where Netflix bills in U.S. currency will also be affected, excepting key international markets such as Mexico and Brazil." None of this necessarily means that Netflix will be swimming in the money. 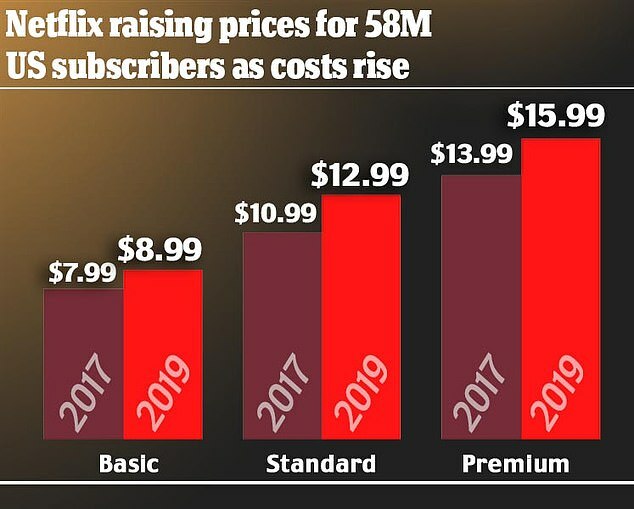 The price hike may alienate future subscribers and threatens to prompt a wave of cancelations, as took place in 2011 when it spliced the streaming plan off from the classic DVD-by-mail plan, which resulted in a 60% price increase for subscribers wanting to keep both and 600,000 subscribers canceling, the Times notes. Customers have largely expressed disappointment with the change on social media, as noted by HuffPo and others. "Yay 300 more original shows no one will ever watch," one Twitterer posted succinctly. 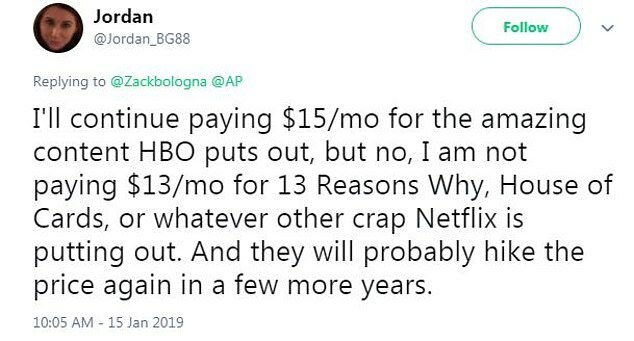 "I'll continue paying $15/mo for the amazing content HBO puts out, but no, I am not paying $13/mo for 13 Reasons Why, House of Cards, or whatever other crap Netflix is putting out. And they will probably hike the price again in a few more years," another person posted. 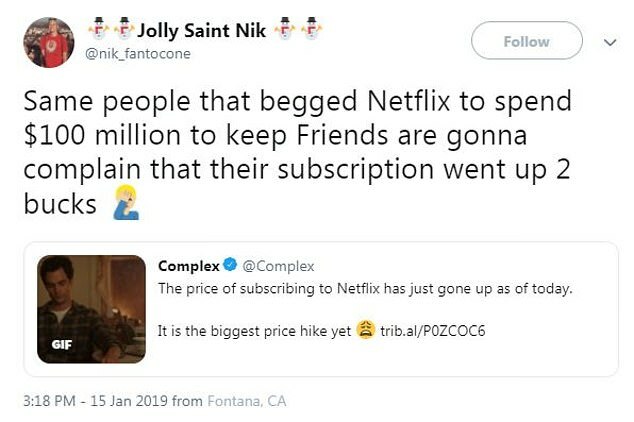 "Netflix doesn't need to raise their prices. We didn't ask for all these trash originals that they cancel after 1 season," said another. 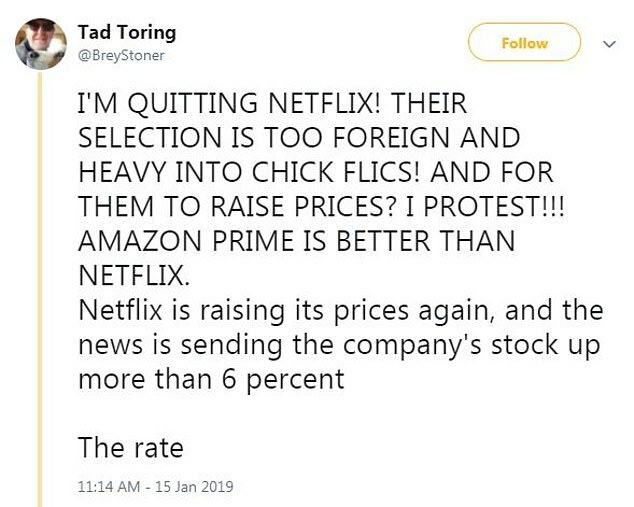 "I'm quitting Netflix! Their selection is too foreign and heavy into chick flics! 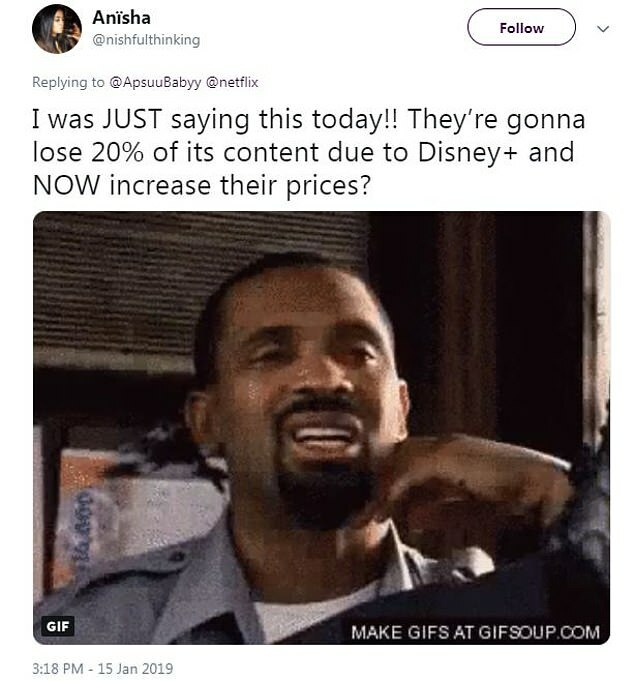 And for them to raise prices? I protest!!! Amazon Prime is better than Netflix," said one user. 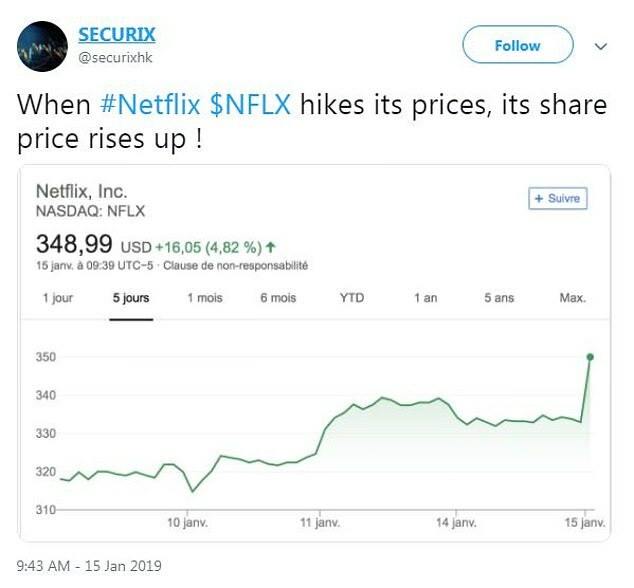 "Netflix is raising its prices again, and the news is sending the company's stock up more than 6 percent."